I get a lot of questions from photographers and love to help out whenever I can. who answered my questions and helped me out in numerous ways when I first started my business. So I definitely enjoy doing the same and helping others out. There are a number of ways that I am available to do this. Find answers to common questions on the FAQs section of my resources for photographers. Also, check out the for photographers category on my blog for full posts on various topics of interest to photographers. If you don't find the answer to your question there, feel free to email me and you may hear the answer via a blog post in the future. 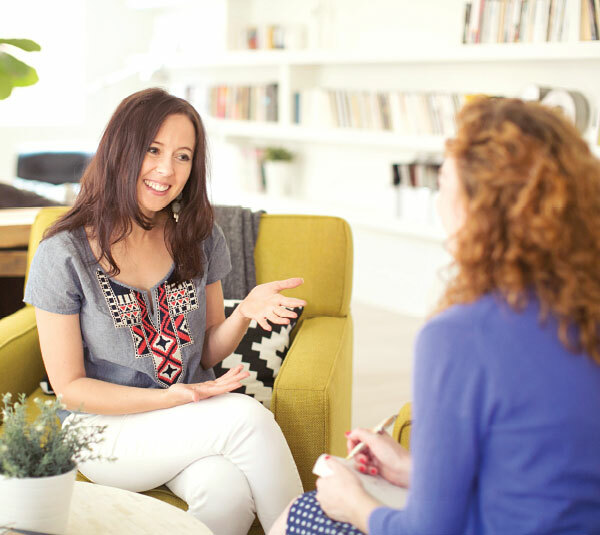 If you'd like further help developing your photography or business, we can set up a coaching session either in person, via Skype, or via old-fashioned telephone. I charge $175 for a one-hour session and we can cover any topics you'd like (except for associate programs and flash-related topics - click the links for resources that are better suited to help you in these areas). Email me links to your work and/or website and I'll give you some feedback. Here is a testimonial from one of the hundreds of photographers who has taken advantage of this service. I learned more in that short period of time with you than I have from anyone else in multiple hours of time. If you are interested in possibly bringing associate photographers on to shoot for your brand and are seeking knowledge on how to build a successful program, I would love to help! Since 2012 I have been coaching established business owners on this very topic and I spoke at WPPI in 2014 and 2016 on Developing a Successful Associate Photographer Program. I currently have 6 associate photographers who photograph over 30 weddings a year for my brand and we continue to see growth each year! Take my free Readiness Assessment to find out if you are in a good place in your business journey to start an Associate Program by clicking below. Or sign up for my comprehensive Coaching Package and get started today! An album is the #1 product I most want my clients to have. Over the course of my career I've photographed over 200 weddings, sold over 100 albums, and made over $200,000 on albums alone. But I also know from first hand experience how time-consuming and difficult it can be to set up an album sales and workflow system. That's why I've made it my mission to help other photographers sell albums well. 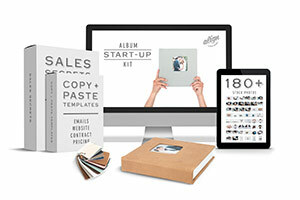 To this end I started Align Album Design and our sole mission is to HELP YOU SUCCEED AT ALBUMS. We're an outsourcing company that frees you up to do what you love, but we are so much more. We have developed a slew of time-saving resources to help you skip the headaches and trial and error that come with selling albums and get right to the good part - making a profit and getting albums into the hands of your clients. New to albums and not sure where to start? This is THE EASIEST AND FASTEST WAY TO START SELLING ALBUMS. These are my favorite albums that I offer my own clients. If you're looking for an all-in-one design and printing solution, look no further! 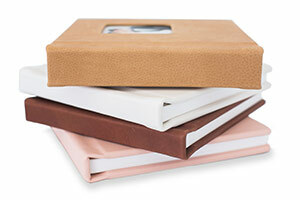 These high quality albums are so popular and your clients will love them! If you're new to albums completely, definitely check out the Album Start-Up Kit. But if you're just looking to optimize some portion of your album sales and workflow process, I've created a blog series over on Align's blog that answers the most common album-related questions I get from photographers. 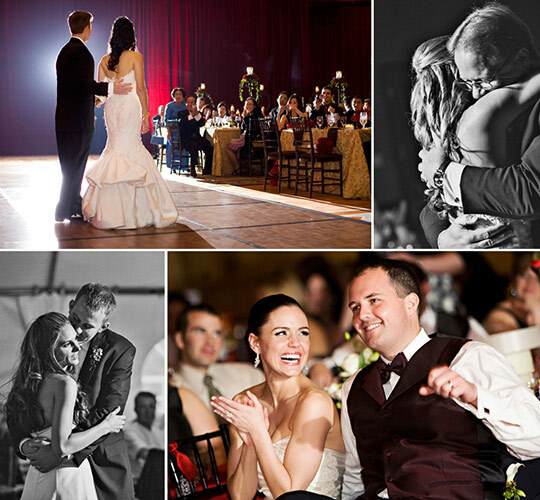 Many photographers love shooting weddings but get bored when the reception comes around. They don't like their reception images and they rarely show them off as a result. Confession: I used to be one of those photographers. I'm not a gear head. And I'm not techie. I don't live to try out the next best speedlight or flash modifier. I just want to make photos that I am proud of. And early on in my journey, I just wasn't. Since then I've figured out the formula that works for me and allows me to create reception images that mirror the quality of the images I take throughout the rest of the wedding day. Recently I've created an eBook in which I share my formula in a non-techie way. It is simple, clear, and even if you've never picked up a speedlight in your life, you will be able to implement each step. I send out monthly e-newsletters with up to date info on what's new with Melissa Jill Photography -- including information for photographers. If you'd like to receive my monthly newsletter, please sign up! I get a lot of emails & questions from other photographers so I thought I'd put my answers all in the same place! I have an entire section of my website dedicated to my gear, completely with reviews. Click here to view! I like to shoot right around 10 weddings per year. The Arizona wedding seasons are Spring and Fall because of the weather, so I try not to shoot too much here in the summer. I love to travel and shoot elsewhere during the summer though!! Can I 2nd shoot for you? I like to work with a consistent team and am pretty much set, but sometimes need a fill-in. Feel free to let me know if you're available and I'll keep your info on file. If you want to make your 2nd shooting services available to other photographers in the Phoenix area, click here and add your info to the list! Promise Tangeman and the GoLive Team custom designed my website and Brock of Infinet Design programmed it. I would HIGHLY recommend both companies! Definitely find a solid, reliable, hard-working and talented designer. Even if you have to pay big bucks--it will save you tons of time and frustration in the end. Who do you use for online proofing? PASS! I love the look and ease of use that PASS provides for my clients. They are integrated with WHCC, so all of my prints are provided through their world-class lab. How do you do your album designs? I outsource to Align Album Design. Align is an album design service company that I actually started years ago to help provide other photographers with fast, affordable and clean album designs. Check out their service here to see if it is right for you! It seems like you're always getting together with other photographers and sharing information. Why do you do that? Aren't they your competition? It's true--I love getting together with other photographers, and talking about anything and everything. When I started my business, another photographer helped me out a ton. He was very generous and answered so many questions for me. I've learned along the way that the more you give, the more you get back. Networking with other photographers is actually one of the best things you can do for your business. That way, we're not in this small business thing alone. We have others to go to when we are in need. And if I'm booked on a certain date, I want to be able to direct that bride to a photographer who I believe in and trust. I lead a local network of photographers that meets monthly in Phoenix to talk about our businesses and photography. It's called the Phoenix PUG (Photographer User Group). Click here if you'd like to find out info about when and where our next meeting is--you're welcome to attend. It's totally free to attend. I definitely recommend that you get involved in the photography community! And if you don't have a networking group near you, call up a local photographer and take him or her to lunch. It's fun! I took photography classes in high school and college, but didn't get my degree in photography. I went to Azusa Pacific University and majored in philosophy and Christian Ministries, with a minor in math. I guess I thought of art as just a hobby at the time and didn't want to touch a business class with a ten-foot pole. But after college, I realized that I had to do something creative for a living in order to feel fulfilled and God directed me toward photography. It's the perfect job and I've learned so much about both photography and business along the way! Click here to read more of my story and how I got my start in photography! Yes. It's located in Phoenix, Arizona in my home. I don't do any shooting here, but it's a great place to work everyday and meet with clients. Yes. Alaine is my full-time office manager. She is so on top of things and makes my life so much easier! Do you use an assistant at your weddings? Yes. I always bring a 2nd photographer AND a third non-shooting assistant to help us with our equipment. It's a team effort! Yes! I have six associate photographers who shoot weddings for my business. Click here to find out more about each of them and to see some of their work! Which camera would you recommend to someone who is wanting to get into photography? First of all, Canon and Nikon are the two best brands for professional cameras. I prefer Canon, but I know there are many great photographers out there who use Nikon. Basically, you need to choose one and stick with it. It's costly to change all your equipment over down the line. The Canon Rebel is a good start-up camera for anyone taking photography classes and wanting to start out with a good SLR in the $600 price range. 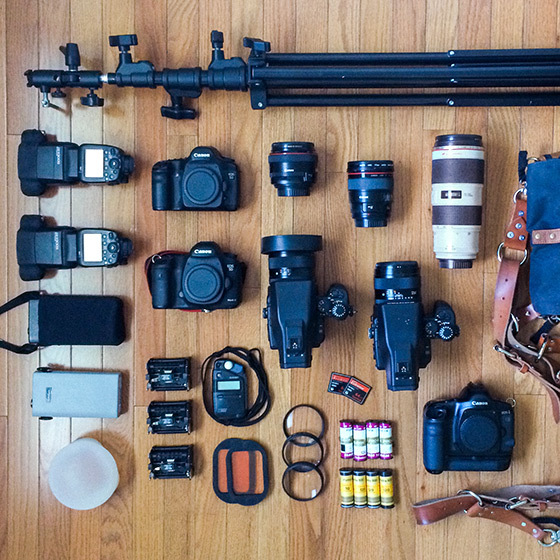 You might think that putting all your money into your camera and getting the best one you can afford is the way to go. But it's important to remember that lenses can be just as expensive as your camera, if not more. And lenses are actually a better investment over time than your camera body. Cameras are like computers--they get updated so quickly that as soon as you buy one, the new model is out and yours is outdated. But good lenses will last you a life-time. So I always recommend that people put the bulk of their money into purchasing good lenses rather than into a top-of-the-line camera. Look for a variety of lenses with a low f-stop. Oftentimes, the lenses that come with the body in a "camera kit" aren't great quality, so look into buying the body and lenses separately. The Canon 50mm 1.4 lens is a great lens for the money! I’m a Hybrid photographer who shoots film in natural light and digital after dark. I've done a number of reviews and educational posts related to how I use my equipment on my blog. You can find them here: 8-part Series on my Transition to Film, 4-part Lens Series, Canon 50mm 1.2 review, Canon 70-200mm 2.8 IS review, Canon 24mm 1.4 review, and Canon 600EX-RT review. I purchase all of my gear online from B&H Photo. They have super-competitive pricing and fast delivery. I'm an affiliate for B&H, which means that anytime someone clicks over from my site and purchases something there, I get a teeny-tiny (2%) commission. If you've found the free information on my site helpful to you in any way, I would greatly appreciate if you would use this link or any of the links from this page or my blog to B&H to purchase your gear. It won't cost you anything extra, but it will be a very sweet way to say "thank-you." Over the course of 11 years, I have developed a very organized and efficient wedding workflow that offers my clients a high-end experience. All of my workflow forms and resources are available for purchase here, and are a great way to jump-start your way to an organized workflow or to take your current workflow and client experience to the next level. This form is my "wedding day at-a-glance" form that I use to gather information about the client that I need to access all the time - contact information, wedding day timeline information and package information. I will grab this form when on the phone with a potential client and also during my initial client meetings. It is also my go-to form with all the info I need on the wedding day. I use my "Tips for Getting Your Best Wedding Images" to educate clients up front about a few simple things they can do during the planning stages of the wedding that will ultimately impact their photography. I include a physical copy of my tips in my new client kit that I give clients at initial client meetings. If we don't meet in person, I will email them a .pdf after they book. This workflow has been developed over the course of 10 years. It was much simpler when I began. It is fashioned with a high-end client in mind (paying an average of $8k-$10k/wedding). There are three main sections to the workflow. The top section is the pre-wedding workflow, the middle section is for equipment prep before the wedding day, and the last and largest section is post-wedding workflow. This workflow is managed by me and my full-time office manager. It is color coded so you can see which tasks each of us is responsible for. My 2-page wedding contract has been reviewed by a lawyer and is a great starting point for any new photographer. I email this 4-page questionnaire - in a fillable .pdf format - to clients after they book. I love reading through it and getting to know my clients better! I use their answers for multiple purposes: to brainstorm unique and personalized ideas for their engagement shoot, to help my team get acquainted with them on the way to the wedding, and to help me write their story for their wedding blog post. It's so valuable! I email this 3-page form, in a fillable .pdf format, to my clients about a month before the wedding. I use it to get all of the final details I need before the wedding. It is helpful for finalizing the timeline and finding out which group portraits they are wanting. This form also includes a vendor contact list. It is important to get this information from the bride before the wedding so I can promptly blog and link to all the vendors involved. It is also handy for knowing which vendors to send photos to after the wedding. I email this form to my clients once their initial album design, and all of their wedding image proofs, are online. Along with the email template we attach this to, it contains all of the information the client needs in order to make choices about their album and send us any revisions they may have. This form makes communication very clear, and carrying out the client's revisions simple. Included here are three different sets of survey questions that we approach clients with at three different points in their client experience - after they book, about a month after the wedding, and after the album is delivered. These surveys are sent to the client through an online survey program called Dilogr. It is SO helpful to get feedback from clients on their experience - both for improving my business and for defining my brand. Instead of putting my contact information and traditional "signature" in the signature section of my email program (under preferences), I save copies of emails that I use at different points of my workflow there so I can drop them into a new email as a template and customize them. I've included 14 of my most commonly used templates here - 11 for use with clients, and 3 for use with vendors. When paired with my Wedding Workflow Checklist and other workflow forms, these will really give you a good understanding of my workflow and the kind of client experience I strive to offer. If you are interested in multiple forms and resources listed above, this is the way to go! By purchasing this bundle of all 9 of my workflow forms and resources, you get a discount of over $100, plus I throw in a .pdf of my package and pricing information. Our studio shoots between 30-50 weddings per year, and we have partnered with some amazing companies to make different steps in our workflow profitable and efficient. We couldn't offer the exceptional turn-around time and service that we are known for without these valuable partners. Melissa Jill created Align Album Design to meet the growing need for a fast & affordable album design resource for busy pro photographers like herself. You upload your images and pick your design style. Align designs your album in 4 business days or less. Then, you and your clients get up to 3 rounds of revisions. Once the design is finalized, you can download the layouts as .jpgs or layered .psds, and send them on to the album company of your choice for printing and binding. ShootDotEdit is the first choice post processing partner for the Wedding Pro, and everything they shoot. They make your images look consistently awesome based on your chosen color profile. We use ShootDotEdit for the bulk of our color-correction and image-processing needs. They provide turnaround times as fast as 48 hours. Fast is Best, and no one is faster. White House Custom Colour is the pro lab I partner with for state of the art custom prints. Clients view their gallery of proofs online through a beautiful software interface called PASS, and are able to order custom prints through their online shopping cart. WHCC prints them to perfection and ships them straight to my clients.